Hospice of the Red River Valley CNAs work with patients to provide individualized care based on each person’s preferences. Hospice CNAs help patients with personal care needs, including feeding, bathing assistance, shaving and nail care. They also provide light housekeeping services for individuals under our care. But perhaps the most important aspect of a hospice CNA’s role is preserving the patient’s dignity and respecting their wishes for personal cares, as the CNA often spends the most time with a patient while providing the most delicate of cares. 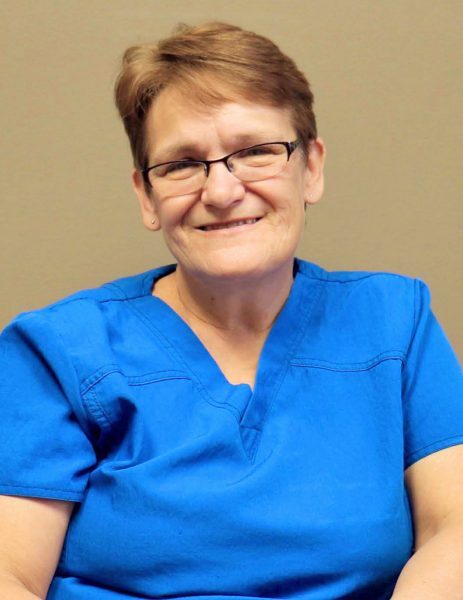 We spoke with Hospice of the Red River Valley CNA Suz Bristlin about the distinct role of a hospice CNA and her more than 10 years of experience providing care and support to our patients and their families. What do you enjoy the most about working as a hospice CNA? I enjoy the one-on-one time I get to spend with someone. When someone is on hospice care, you know that person is asking for you to be there so you feel like it’s a pleasure to go in and take care of them even though some of them are having difficult days. You have to learn to go with the flow, learn what the person likes and doesn’t like. But I never have had to worry about whether or not I was going to be welcomed into a person’s home. Before I started working with Hospice of the Red River Valley, I was a CNA at the Frazee Care Center for 18 years. There were a couple of people in the facility that were on hospice care, and I would see Hospice staff come in and give them special attention. While there, I sat with a gentleman who was dying. He had three sons, but they didn’t want to see him like that, and I didn’t want him to be alone when he passed away. So I sat with the man until he was gone. After that, I told my husband if there was ever an opening for a CNA with Hospice, I just thought that was something I wanted to do. I don’t want somebody to have to pass away alone with nobody there, and Hospice is such a great organization. Two days later, there was an ad in the newspaper for a CNA opening at Hospice. This is the start of my eleventh year with Hospice of the Red River Valley. I have been working out of our Detroit Lakes office in a CNA role the entire time, and I was the first CNA to join the Detroit Lakes team. I also say I have kind of a strange background because I’m also a volunteer EMT, helping save people in emergency situations, and then through my role at Hospice, I put on another hat and help people transition to the end of their life. I have always liked helping people, and I adjust to whichever frame of mind I have to be in at the time depending on the type of care I am providing. I try to be the best I can for everybody in that particular situation. What qualities help make someone a good hospice CNA? You definitely have to be a caring person. You have to be able to adjust to different ways of living and accept the people for who they are and what their lifestyle is like, especially if you’re going into someone’s home. You’re not there to judge them on what their house is like; you’re there to take care of them and enhance the quality of life they are living right now and not try to change it. What is a CNA visit like? I go into each visit with an open mind and treat people how I would want to be treated. Before you leave the home, take a look around and think: would you be proud to have someone come in and see the person the way they look? Every care we provide for the person might be the last time he or she ever gets that care provided, so I complete each care to the best of my ability. I meet people where they are at and what they need depending on the time of day. If you’re there early in the morning, you may help get the person out of bed and assist them with personal cares, giving them a shower, helping guys shave, taking care of their oral needs and making their bed. If time allows, you may help the person eat breakfast. If I arrive in the afternoon, ladies typically like to have their hair fixed and their fingernails polished. No matter what time of day I see the person, I always take time to give them a backrub and lotion their feet and hands. It has a huge impact on a person’s family when you make their family member look nice. The family understands you really do care about the patient as a person, and it helps them see their loved one like they normally would. If you could tell patients and families one thing about your position, what would it be? I’m here to assist you with any of your personal cares that you would like me to. I always remind people this is my job, and I’m not going to do anything you don’t want me to do. You’re in charge, and what you say is OK for me to do is what we’re going to do today. How does working at Hospice of the Red River Valley align with your own personal values? I take care of people the way I would want someone to take care of me or my family. If I can’t do that, I shouldn’t be doing this job. I wish people knew how hospice care has changed. It’s not just for somebody who’s going to die in 24 hours or less. When they get on our services early enough, they are able to communicate how they like things done.